The young men who live in the same building with Writer/Director/Producer Bruce B. Gordon often chat about sports, work, and “girlfriend drama.” The fact that they are disabled doesn’t affect the kinds of desires, hopes, and dreams they have – and that’s exactly the humanizing story Gordon seeks to tell in his new short film, “Whole ‘Nother Level,” which will be featured at the Cannes Film Festival this year. In the movie, a young man with cerebral palsy must pass a final exam required to qualify for job training and independent housing assistance, and the stakes are high – his aging parents will be forced to institutionalize him if he fails. Gordon was inspired, not only by his young neighbors but also by his wife’s work as a school psychologist, testing special-needs students. “The main goal of the film Whole ‘Nother Level is to raise the public’s awareness and consciousness about people living with disabilities,” he notes. 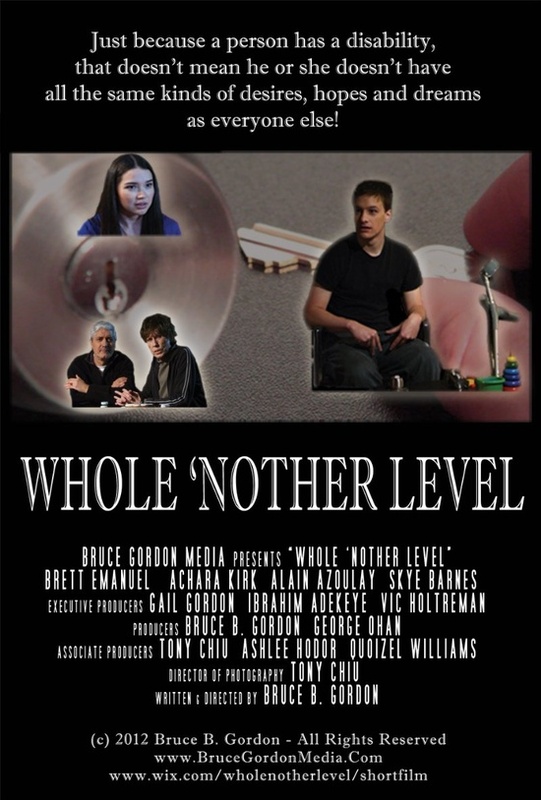 Gordon wrote the script and gathered colleagues, primarily from the Los Angeles Film School, to create Whole ‘Nother Level, his thesis film. 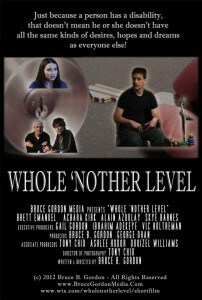 It is co-produced by independent film producer George Ohan, and features Brett Emanuel as Randy Larson. The cast of this complex drama is rounded out by Achara Kirk (the romantic lead), and Alain Azoulay, who is appearing in a record six films at Cannes this year (5 shorts & 1 feature) — a tribute to Gordon’s casting acumen as a director. Originally a songwriter and music producer from Detroit, Gordon began his career in Hollywood performing for a TV award show and writing music for an independent feature film. After landing a college internship with Columbia Pictures (Sony) Studios, his creative vision expanded to include writing scripts and comedy material, and selling to stars such as Joan Rivers. Gordon also worked for Aaron Spelling Productions after graduating from UCLA. Recently completing expert instruction involving the film-to-digital revolution at L.A. Film School, he has written, directed, produced, photographed, and edited numerous shorts, commercials, and Web corporate promo videos. Whole ‘Nother Level is his first film at Cannes.